Crisp white blooms are accented with a flame of yellow orange. The standards stand stiffly upright, and the falls arch gracefully for impeccable form. The flowers display to full advantage over its spears of dark green foliage. A very usable flower in the garden and in bouquets because its color combines well with any other color. It also serves well for massing to brighten up dark areas. 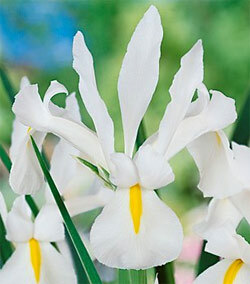 Excellent in borders and for planting in areas where it can naturalize, which is does readily. Grows 18 to 24 inches tall.